Richard Feynman, the prominent US physicist, foresaw the infinite possibility of nanotechnology many years ago. He envisioned a world where the entire 24 volumes of the Encyclopedia Britannica could be written on the head of a pin, in similar fashion as the entire genetic information is coded into DNA, a molecule composed of two amino acid chains that reside in a tiny cell. Feynman believed that advancing nanotechnology would allow us to reposition individual atoms as we desire and build things at the atomic scale. Advances in nanotechnology lived up to Feynman's vision and foresight, making a dramatic impact on our lives, and scientific exploration into the world at the nanoscale still continues. However, the world at the nanoscale is governed by the mysterious laws of quantum mechanics, which are dramatically different from our everyday experiences and present many challenges to researchers. For example, electrons, a component of atoms, are so small that they exemplify many of those weird predictions from quantum theory. For example, electrons may be present at different locations simultaneously-a phenomenon called the superposition of probability amplitudes. 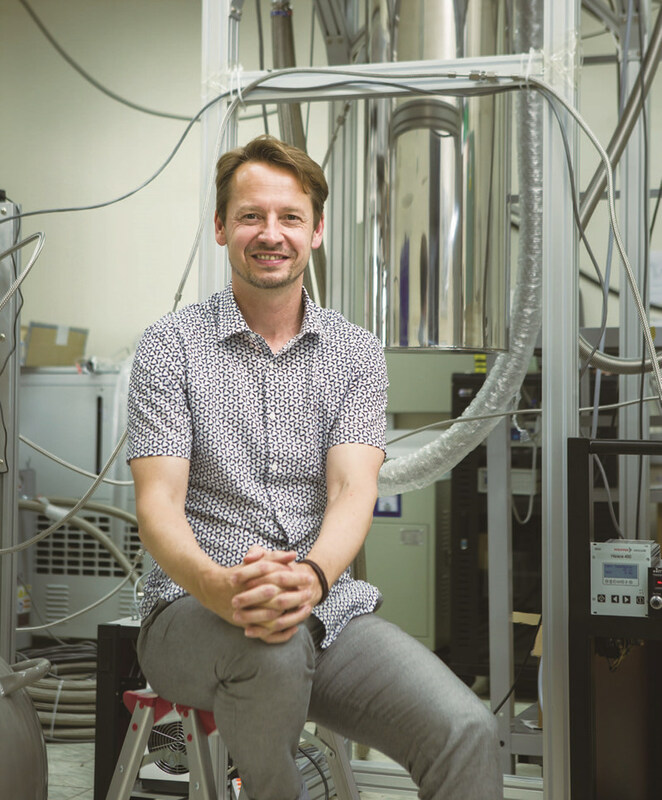 Andreas Heinrich, Director of the IBS Center for Quantum Nanoscience and Distinguished Professor at Ewha Womans University, is a pioneer in the fields of scanning tunneling microscopes (STMs), quantum technology and nanoscience. Throughout his remarkable career, Director Heinrich has worked on enhancing the performance of STMs and investigated the quantum properties of atoms and small molecules on surfaces using this cutting-edge nano-instrument. Established at Ewha Womans University, the IBS Center for Quantum Nanoscience investigates the feasibility of quantum computation using atoms on surfaces as one of its research themes. With the construction of a specialized research wing scheduled for completion in March 2019, Director Heinrich shared the mysteries and possibilities of quantum nanotechnology. "It is certainly an honor to have the international science community recognize my efforts. I'm looking foward to achieving the same level of progress or more in Korea." Director Heinrich recently received two major science awards -the 2018 Feynman Prize from the Foresight Institute and the IEEE Joseph F. Keithley Award in Instrumentation and Measurement from the American Physical Society (APS). 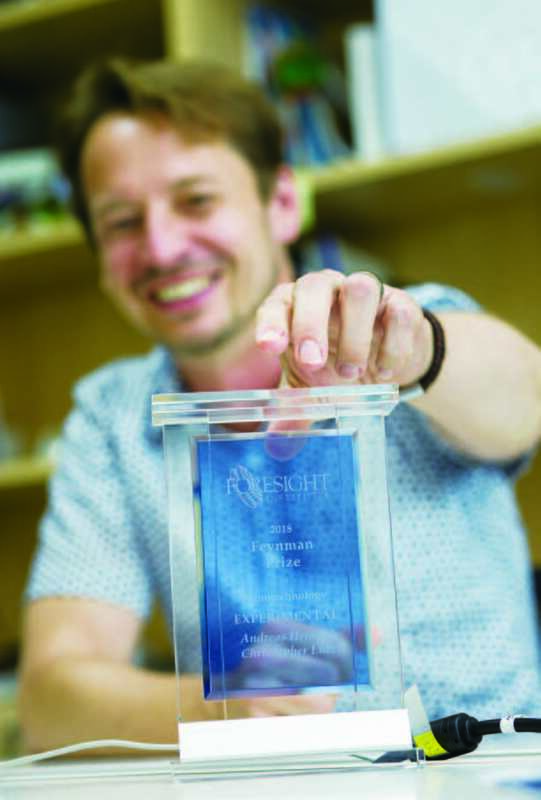 The Feynman Prize was established in 1993 to honor researchers with groundbreaking achievements in the field of nanotechnology by Foresight Institute, a think tank and a research and public interest organization based in the U.S. According to the selection committee, Director Heinrich and (his co-researcher) Dr. Christopher Lutz of IBM Research were acknowledged for advances in the manipulation of atoms and small molecules on surfaces and their employment for data storage and computation. 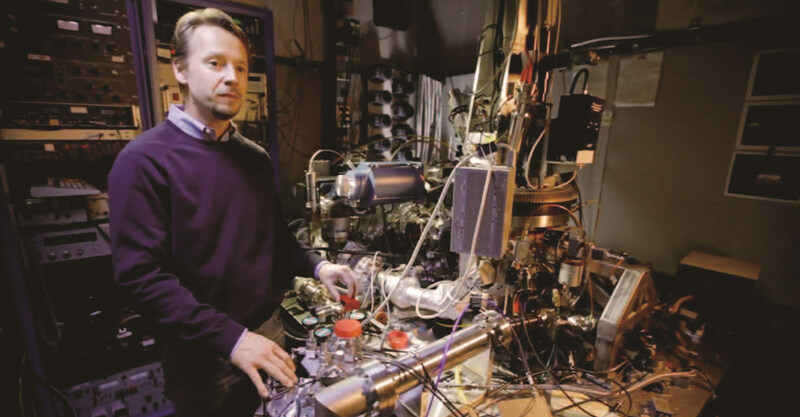 Director Heinrich was also recognized for developing inelastic electron tunneling spectroscopy (IETS), which manipulates the quantum spins of atoms. Since the introduction of this breakthrough 15 years ago, IETS has been widely used by scientific communities throughout the world. A scanning tunneling microscope (STM) is the instrument of choice for imaging surfaces with atomic-scale spatial resolution, including those of conductors, insulators and superconductors. However, it is difficult to measure electron spins (quantum states) with an STM, in which a small voltage is applied between the probe tip and the surface to cause electrons to tunnel across the gap for observing and measuring the properties of atoms. That is where the new measurement technique IETS comes in: "Electric currents from the STM's probe tip check how much energy is lost every time an electron spin changes its orientation. ▲ Andreas Heinrich, Director of the IBS Center for Quantum Nanoscience, proudly presenting his 2018 Feynman Prize. This allows us to precisely measure the energy levels of the spin states of atoms," says Director Heinrich. He added, ''Now we can measure interatomic interactions as well as the quantum state of individual atoms." More recently, researchers have combined electron spin resonance (ESR) spectroscopy and STM based on IETS technique to increase the energy resolution by more than 1,000 times. Thanks to these advances, we are now able to measure electrons in excited states, which is observed in atoms and nanostructures on surfaces, and to distinguish electrons in exited and ground states. Among other advances, this confirms that we can use atoms as a data storing devices. Director Heinrich's favorite childhood pastime was disassembling mechanical devices with a curiosity about what lies inside and how they work. His childhood curiosity over mechanical devices and their mechanism led him to study physics in college, a domain of science that explores nature and matter. After receiving his PhD in solid state physics at the University of Gӧttingen in Germany, Director Heinrich continued his research career as a postdoc at IBM Research - Almaden, the world-leader in scanning tunneling microscopy (STM) at the time. ▲ Director Heinrich standing next to the equipment at his lab at IBM Almaden. Throughout his 18-year tenure at IBM Almaden, Director Heinrich carried out research on atomic and molecular manipulation on surfaces using a scanning tunneling microscope (STM). His postdoc advisor at IBM Almaden was Dr. Don Eigler, a renowned physicist who developed a new use of the scanning tunneling microscope by making it functional in ultra cold temperatures and enhancing its spatial resolution. Advanced low-temperature STMs allow researchers to manipulate and arrange individual atoms freely to create quantum nanostructurcs. It was Dr. Eigler who first demonstrated the technique for manipulating individual atoms, arranging individual xenon atoms on a nickel substrate one at a time to spell out the IBM logo. As part of his research on atoms on surfaces, Director Heinrich developed new experimental equipment that works in ultra-low temperatures and high-magnetic environments at IBM Almaden. As he advanced the cutting-edge equipment, Director Heinrich pioneered new areas of research in quantum nanoscience. A prime example is the article he and Dr. Lutz published in the journal Science in 2002 as part of Don Eigler's group. In this study, carbon monoxide molecules were arranged on an ultra-low temperature copper substrate in atomically precise configurations, or molecules cascades, where the motion of a single molecule caused the subsequent motion of another molecule, creating a cascade of motion similar to a row of toppling dominoes. When the motion stops, the final position of the molecules translates as the value of the calculation. This novel concept recognizes the position of each molecule on the surface as digital information. In 2015, Director Heinrich led the team that succeeded in implementing the electron spin resonance (ESR) measuring technology to an STM, dramatically enhancing the equipment's resolving power. Prior to this study, it was often impossible to directly measure the difference in energy levels between electrons in excited state and in ground state due to STMs' relatively low energy resolving power. Thanks to the increased resolving power, we are now able to measure the value of "0" and "1". This research is expected to serve as a significant first step towards developing a new type of quantum bit by complementing other quantum bits (the basic unit of information in a quantum computer, also called Qubits) from previous studies. During his 18-year tenure at IBM Research, Director Heinrich authored over ten articles featured in the academic journals Science and Nature. Making smaller computational devices with less energy consumption begins with reducing the amount of space taken up by one bit of digital data, as we see in the heated race to shrink the size of magnetic storage devices such as hard drives. In 2012, Director Heinrich and the research team that he led at IBM demonstrated a magnetic moment that lasted for hours, creating the smallest possible unit of magnetic storage by arranging two rows of six iron atoms on a surface of copper nitride. At the time, Director Heinrich believed that further progress was unlikely as quantum science is a highly challenging domain. To his great surprise, a Swiss research team used a different approach and demonstrated that a holmium atom, once put in motion, can maintain its spin magnetic moment (quantum-mechanical magnetism) for longer durations. The success of the Swiss team's research motivated Heinrich, now as director of his newly created IBS research center, to continue his own research, not only verifying their findings but making further progress, which was published in the journal Nature in 2017. In this study, Director Heinrich's team succeeded at writing and retrieving one bit of digital data with a single atom. They used a single atom of the rare-earth element holmium and precisely placed it on a surface of magnesium oxide, which makes its north and south poles hold in a stable direction. The two stable magnetic orientations define the 1 and 0 of the bit. The team then used the STM probe to pass an electrical current through the holmium atoms to flip its north and south poles, thus replicating the process of writing the binary data (ls and Os). Since commercially available hard drives traditionally use about 100,000 atoms to store a single bit of information (a 1 or 0) using traditional methods, Director Heinrich's achievement of storing one bit of digital information on a single atom was indeed the advent of the world's smallest data storage. After the announcement of the study result, Director Heinrich commented, "We observed that even small distances between holmium atoms do not affect their electron spin. Our next goal is to further investigate the mechanism behind the behavior and replicate the result at higher temperatures." He also added, "If follow-up research makes it possible to control atoms to exist in both "spin" states (1 and 0) simultaneously, we will be able to assemble them into qubits for quantum computation." Currently, research on basic components of quantum computation at the atomic scale still remains at its infancy. Director Heinrich made it clear that the focus of his work is basic science, not practical applications like quantum computers. "I would like to focus more on the investigation of quantum states inside atoms. This may lead to meaningful findings for practical applications such as quantum computers and quantum data. We may come across new opportunities in practical applications, but I prefer to remain faithful to the fundamental objective of IBS - basic science research. I would rather focus on testing limitations in basic science research and figuring out how to overcome them. I do not have all the answers yet and that is the beauty of our research." The IBS Center for Quantum Nanoscience conducts world-class research in the manipulation of the quantum properties of atoms and molecules on surfaces and near interfaces. Production of "Quantum" Animations: "A Boy and His Atom" and "Ewha Womans University"
Director Heinrich is a prominent figure both inside and outside of the science community thanks to his effort to engage with the public. A prime example is "A Boy and His Atom," the world's smallest stop motion animation and the winner of the Golden Lion Prize at the Cannes Lions International Festival of Creativity. A team of IBM researchers led by Director Heinrich used a scanning tunneling microscope and moved 65 carbon monoxide atoms frame by frame, piecing together 242 images for the animation. Director Heinrich said, "It was produced as part of IBM's corporate marketing program to communicate why IBM does basic science and to raise its brand profile among younger generations." He added, "The four researchers in our team worked day and night for ten days, having great fun while doing it." Explaining his motivation for the project, he said, "I personally like engaging with people from outside the scientific community, and really wanted to show that science truly can be fascinating." When asked about plans to produce another animation, Director of Operations Michelle Randall answered, "QNS runs a YouTube channel explaining the science behind our research in engaging ways and we are considering making many things, of course including an animation that spells 'Ewha' with atoms." The videos on the YouTube channel feature scientific content that appeal to both Ewha students and the general public. One of the people actively involved with the channel is a QNS researcher from Germany who was the runner up in a competition for scientists to showcase their ability to communicate scientific topics to a general audience. ▲ Director Heinrich standing in front of experimental equipment with Director of Operations Michelle Randall. The husband and wife duo lead the center's operations. The center makes a broad range of efforts to engage with the public, from producing promotional videos to hosting public events. "2018 Art Competition: The Art of Quantum Nanoscience" is a good example of such efforts. "Artists and scientists are both creative, use tools in their work, and need to have an understanding of objects," explained Ms. Randall. She added, "In the long term, we want to develop an artist residence program, similar to the one that run by the Center for Quantum Technology in Singapore." "2018 Art Competition: The Art of Quantum Nanoscience" takes an unconventional approach - artists do not just submit finished artworks but are invited to engage with center researchers, learning about the science and exchanging ideas. Once they are registered for the contest, artists can meet up center researchers to learn about quantum nanoscience and share ideas and creative inspirations. Artworks that pass the selection process will be featured in the new research wing to be completed next year, and the center plans to dedicate an exhibition space for the artwork. 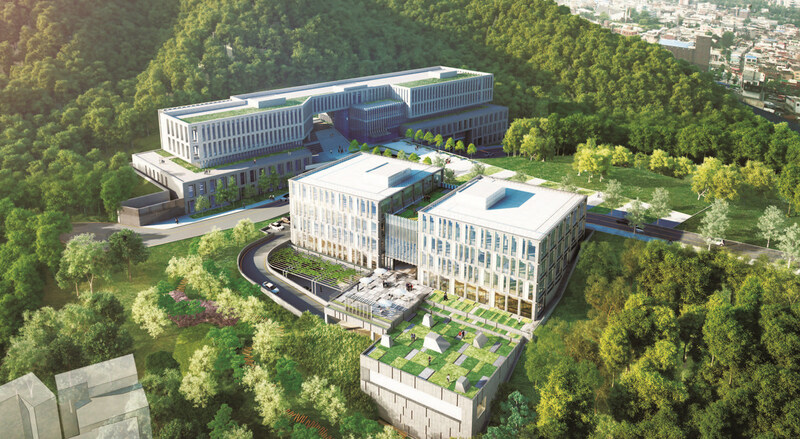 The new research wing is currently under construction for the center at Ewha Womans University, scheduled for completion in March next year. The new building will house a number of cutting-edge research equipment, including a scanning tunneling microscope (STM). 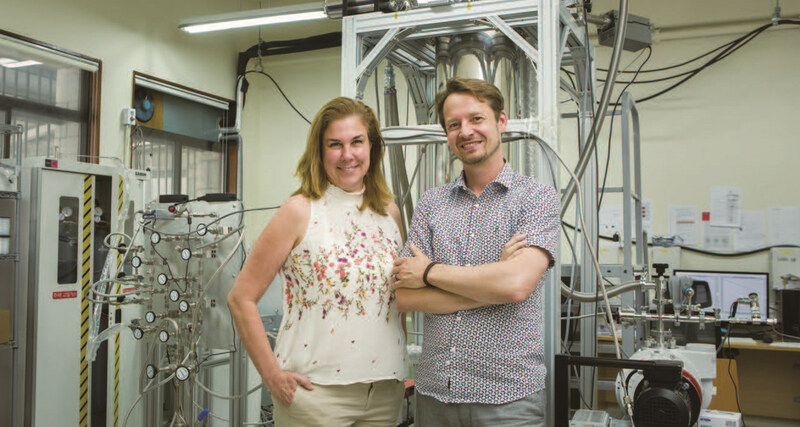 "We will have about ten different systems and use the equipment to figure out the most effective environment for manipulating atoms and small molecules on surfaces," said Director Heinrich. The new equipment includes a laser system for manipulating atoms on surfaces and a system for modifying such systems with high-frequency electronics. ''We have gotten good results by increasing the accuracy and precision of our equipment over many years. We will continue our efforts and find answers to unanswered questions," explained Director Heinrich. ▲ An aerial view of the center's new research wing under construction. An outdoor space will be created as a lounge area for researchers on the rooftop of the building that will house state-of-the-art equipment. Director Heinrich said, "We are going to bring in commercially available equipment that meet the required specifications, but we also plan to build custom tools in order to add novel functionalities we need in those tools." He added, "It is often more effective to buy commercially available equipment and then to add the required functionalities." Director Heinrich believes that it is important for researchers to learn to build their own experimental equipment as well as master the related techniques. Center researchers are currently supported by two engineering staff members. Connecting with people is very important for Director. Heinrich, who led a small group of four to five researchers at IBM Almaden in a family-like environment. "I would like to become a mentor figure to our researchers where I can help them grow professionally with my knowledge and knowhow. This is part of creating a family-like atmosphere where researchers enjoy spending time and working together as a tight-knit group. The IBS Center for Quantum Nanoscience finds value in serving as a conduit for exchange between science communities in Korea and abroad. Director Heinrich said, "Korean scientists used to go to other countries for research in the past. But I think the time has come for researchers from other countries to come to Korea for work, and the center is playing an important role in promoting such exchange." The center is taking part in joint research and human resource exchanges with quantum nanoscience centers in Germany, Italy, Switzerland, the Netherlands, France, the U.S., Hong Kong, Singapore, China and Japan. In September, the center will host eight top experts from around the world at its workshop on research topics in quantum nanoscience. Director Heinrich firmly believes that nurturing young researchers is one of the main missions for the center. He said, "I hope that in ten year's time, researchers from Korea and many countries from around the world will looks back at their successful time at QNS at a reunion party. I sincerely hope to see a strong presence of our researchers at top organizations all over the world."